Tomorrow is it. Nearly five months from their last attempt, Turkey’s voters are off to the ballot box again. All the indications are that they will deliver pretty much the same result. What does that mean? It means an AK Party (conservative, religious) that wins the most votes and seats, but not a parliamentary majority. It means a CHP ( social democratic) that is easily the second party, but still far away from the AK Party’s heights. And it means two other parties – the Turkish nationalist MHP and the pro-Kurdish HDP – in the chamber with substantial numbers of seats. 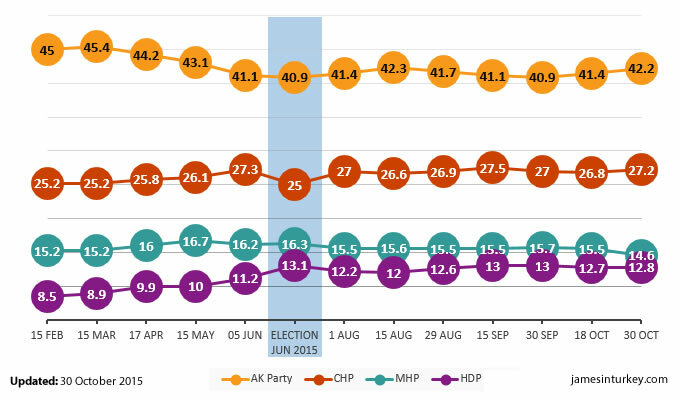 Pretty much every Turkish opinion poll in the last fortnight has shown a noticeable increase in support for the AK Party and a parallel drop in MHP support. The CHP and HDP, meanwhile, have roughly hovered around a percentage point of where they were immediately after the election. 1) The AK Party will add a few percentage points to its vote, but the handful of seats it produces is unlikely to give them a majority. However, the party could be close enough to the 276 line to claim a mandate for a minority government. 2) The CHP looks set to increase its vote share, but Turkish electoral maths means that it’s unlikely to gain many seats outside traditional strongholds like Izmir. In fact, the CHP may even lose seats in places like Erzurum. 3) The biggest losers of this election appear set to the be the nationalists. The MHP gambled a huge amount by refusing to cooperate with any other party after the June election. It seems that policy – and the mounting conflict with the PKK in the southeast – will lead many MHP voters to return to the AK Party. 4) Not one opinion poll has placed the HDP below Turkey’s ruthless 10% threshold this time – this will be a four-party parliament again. Indeed, co-leader Selahattin Demirtaş appears quite confident that his party can exploit the MHP’s weaknesses and leapfrog them to become the third largest party. There simply isn’t enough regional polling to indicate whether that outcome is possible. James in Turkey will be covering the election in a live blog from Sunday morning – click here to follow it.